If you are a shooter, you will understand the importance of using eye protection when shooting. Why wear eye protection when shooting? Safety glasses can save you from a direct hit. The shooting activities usually take place close to the eyes and face. The rifles and shotguns are held on your shoulder, and the handguns are kept only at an arm’s length away. Your eyes can get hit by ejected shell casings, blowing dust, etc. Even the sun, wind, dust, etc. can affect your shooting activity and vision problems. So, you should wear safety glasses all the time. Eye protection can protect you from accidents. If you hunt without it, blowing dust, etc. may get into your eyes and the eyes may get burnt. Safety glasses can give protection from the environment. For example, when you go hunting in forests, twigs, leaves, and tree branches may cause harm to your eyes. When you are cleaning firearms, you should wear the safety glasses so that cleaning products or springs that came lose can get into your eyes. Glasses will help you focus more clearly. You will be able to see your target more clearly. So, you will be able to shoot your target accurately. You can buy shooting glasses without any prescription. The lens of the glass should be of good quality for better protection. The safety glasses are specially designed. The glasses have various features. These glasses are not like the popular aviator-shaped frames. Here are the special features of protective glasses for shooting. The frame of this glass has a safety rating. You should never buy a glass that doesn’t have this rating. Glasses with safety ratings have a strong rim, and so the lenses don’t fall off easily. You will find ‘sweat bars’ in some glasses. It goes along the frame’s width and provides stability so that it stays on your face. Some glasses have padding on the frame, and it is used as a cushion on the face. This feature will protect your face from gun recoil and other elements. There are glasses that have temples with spring hinges so that the frame can move without breaking. Some glasses have temples that wrap over the ears so that the frame stays in the right position on the face. There are soft silicon pads around the nose area also so that the frame stays in place. There are bridges in some shooting glasses so that you can adjust the glass to various locking positions. The frames are made of plastic, polycarbonate, titanium, etc. The most popular types of lens are made of polycarbonate, and they are highly resistant to impact. These lenses are UV protective and have a scratch-resistant coating as well. You can order lenses in different colors to shoot in various light conditions. Most shooters prefer yellow or orange colored lenses. These lenses can block the haze and blue light. You can use a bright yellow lens for shooting in low light. If you are targeting an orange object on a green background, you should use a purple lens. If you want a neutral color lens, you should go for gray. You will be able to see all the colors naturally. Some people use polarized lenses that reduce glare. Wearing shooting glasses is essential for protecting your eyes. Sometimes your firearm may malfunction, and falling shop or clay target chips can get into your eyes. It is also necessary to wear protective glasses when cleaning guns. You should check the safety ratings before buying a shooting glass. You should always use a shooting glass when you are shooting indoors or outdoors. 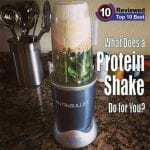 What Does a Protein Shake Do for You?